This omelette I just made is delicious. Fresh mushrooms, red bell peppers, fresh spinach, Colby Jack cheese, topped with my favorite salsa. I’ve been fantasizing lately about starting a food-themed podcast; last night while I was driving home from Book People I caught myself composing a business plan around a pizza-specific theme. It will likely remain an unfulfilled threat for the foreseeable future, but who knows what will happen once I get this wedding thing out of the way. Making omelettes in the morning has become something of a zen ritual for me. I try to dice all the vegetables I’ll use in a week in one setting on Sunday afternoons, as soon as we get home from the grocery store excursion. This makes whipping up a veggie omelette pretty fast, as I already have tubs full of diced bell pepper, zucchini, and squash. I slice the mushrooms fresh every day, which takes less than a minute. A handful of fresh spinach leaves, and maaaaybe a 1/4 cup of diced vegetables, depending on how stuff an omelette you want. I sauté all the vegetables in butter with a clove or two of garlic. Sometimes I add salt and pepper, and if I’m feeling adventurous, either smoked paprika or cayenne pepper. I whip up one egg if just feeding myself, two on the weekends when we’re both home (I make one omelette and we just cut it in half). Melt some more butter (I use a 12 inch non-stick pan to do this) and coat the whole pan with the butter before quickly tossing the egg in. Then I have to pick up the pan and swirl the egg around until there’s a fairly even circle all over the flat bottom. Then it’s time to scoop the vegetables back in, covering half of the egg. I throw in a handful or slice of whatever cheese we’e got on hand, fold it the egg over the filling and flip every few minutes until both sides are browned. Every morning I do this. I found the most magnificent pillow at World Market today. 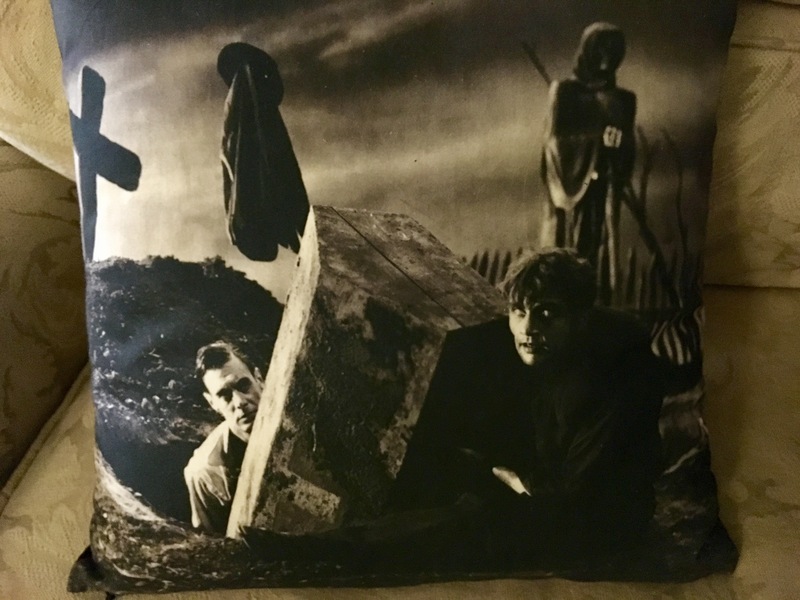 That, my friends, is a throw pillow depicting the grave robbing scene in the original Frankenstein film. October is the only time of year that I can really shop for home decor. Our apartment is a bit of a wreck at the moment, filled to brimming with Halloween projects in progress, and bags upon bags of paper bats. I can’t believe our party is a week from tonight. The temperature has finally dropped a bit here in Central Texas. The mornings are crisp and the crow that winters in our neighborhood has been making a racket. This means that the time of baking experimental casseroles is again upon us. The inaugural event was last night, utterly destroying my kitchen for the sake of a rather bland attempt at cheese sauce that desperately needed both salt and a completely different recipe. 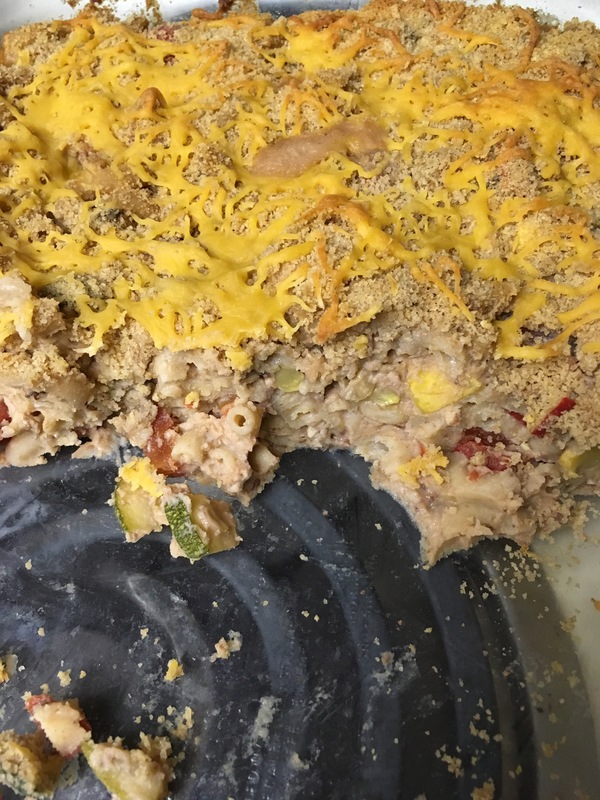 I call it Vegetable Mac & Cheese of Failure. Happily, we found that a liberal dusting of Tony Chachere’s Cajun Seasoning salvaged the grayish concoction. We will be subsisting on the casserole for most of the weekend. Tonight we are heading to SCARE for a Cure, one of the best haunted houses in Texas. It’s a fantastic haunt; nearly an hour long walk through of a scripted story that involves puzzle rooms, sacrificing someone in your group, and (hopefully) defeating the boss at the end. It’s a Halloween tradition, we go every October. And we always get covered in stage blood. Tomorrow is a Halloween party prop-building work day; we lure people in with promises of pizza, then give them cardboard, paint, and vague instructions. Cityscapes are not a fast build. Nor is an atmospheric representation of the Adam West Bat Cave. If you need some Halloween horror in your reading queue this week, I recommend any of Thomas Ligotti’s short stories. I recently picked up Songs of a Dead Dreamer and Grimscribe, anthologies of his works in the 1980’s. Imagine someone who consumed Lovecraft as an influence, and then surpassed him. Lovely, twisted stuff. I’m going to read another of his stories before we head out to the haunt. Right here on the couch with my amazing new pillow. I had to run back to the store Sunday night to grab some things that Instacart couldn’t find (more on that in another post), and happened upon a mountain of blackberry pints on sale for a dollar. I grabbed one impulsively without a plan (bad habit), and it sat on my counter for about 48 hours. On that same trip I made another impulse buy, a bag of chia seeds, after reading about all the bizarre things they can do that help with vegan substitutes. On the back of the bag was a recipe for blueberry jam, and it occurred to me that adapting it to my pint of blackberries would be pretty straightforward. Tonight, finding myself home alone while Reed is at a corporate dinner, I did some science. Boiling blackberries are fascinating to watch. They just keep rotating like that, looking like horrible little monster eggs full of some unholy substance, or maybe recently infused with a blood sacrifice. I can’t look away. The recipe I played with is simple. Throw the berries in a saucepan with some agave nectar on medium heat for about five minutes, then toss in the chia seeds and let that simmer until thick and gooey, about 15 minutes. Take off the heat, stir in some vanilla, and allow it cool. 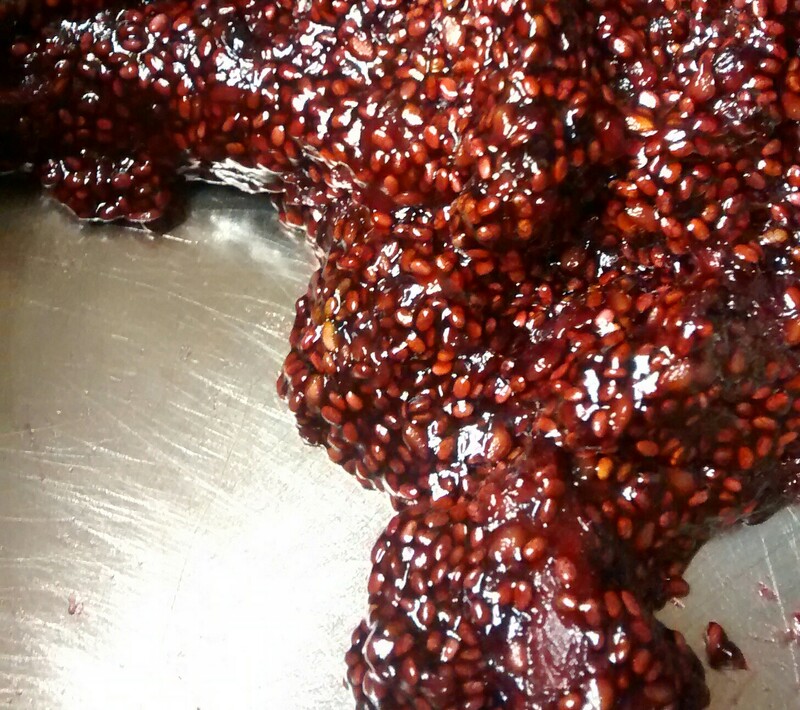 Chia seeds are so weird. All that liquid boiled down into this jammy stuff in about ten minutes after I added the seeds. No gelatin, just stuff that came from plants. I’ve been reading on how you can grind them up in a coffee grinder, then chill for a bit, and that turns them into the most perfect egg replacer for baking, ever. I may be trying to bake some quick bread this weekend. If I can turn my chocolate pumpkin bread vegan with no qualitative loss, then there will be stopping me. 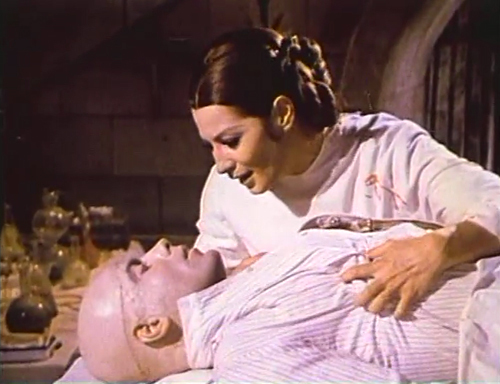 In the course of looking for silly supplemental photos, I learned about a horrible 1971 Italian horror film called La Figlia di Frankenstein (Lady Frankenstein). Based on what Google Image Search is kicking up, it was porntastic, in the tradition of Italian horror. The Wikipedia article’s plot summary gives the impression that it’s a combination of the first four films of the original Frankenstein franchise, with a female main character using her sexuality as a power play over the men. I’m going to have to find this movie, wow.